I know I've already posted about the Tartan trend, but this is the article I wrote for my university magazine, Platform. I couldn't upload it till now because I had to wait until it was published, but I wanted to share it with you all. 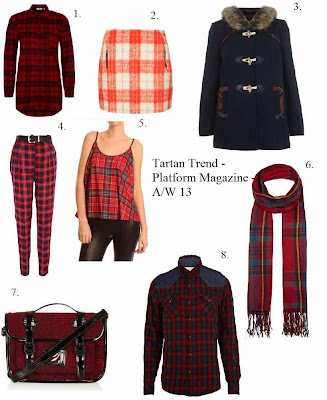 Its origins hail from the Scottish Highlands but Tartan will soon be in everyone’s wardrobes! It’s hard to ignore this season’s biggest trend – it’s in numerous magazines, all over social media and stocked in the stores. 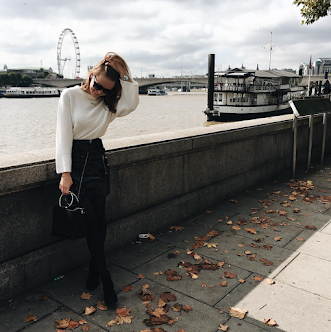 Here’s my pick of the best pieces on the high street. When thinking of Tartan you automatically think of a check shirt! Plus the Boyfriend cut makes it great for a casual day shopping. Just a pair of leggings and converses and you'll be set to go! This garment will be one of your wardrobe staples for this season I promise! This is such a cute skirt, perfect for a few drinks out with the girls. Having it in orange will guarantee you stand out from other trend followers. For a formal look pair it with a crisp white shirt. With winter fast approaching its time to start thinking about coats. This is a more subtle approach to the Tartan trend, with just a little bit of detailing. Plus the fur collar will ensure you stay warm during the cold walk to your 9am lecture. If you’re feeling very brave, then these trousers are prefect for you. It takes a lot of confidence, but it will be worth it. For ultimate attitude, wear with a spiked-shouldered top. This top is an easy way to sneak tartan into your wardrobe. The colours aren’t too harsh either so it’ll suit anyone, whether you're a fashion leader or a fashion follower. At £4 how can you say no to this absolute bargain?? It’ll be perfect for the chilly winter months here in Nottingham. Alternatively you could go for the black version of this like me. If you want to approach this trend with accessories rather than clothing, this bag is what you need. Pair it with a plain tee, to make sure it stands out. Men can join in this trend too! This shirt is easy to wear from day to night. I especially love the shoulder patches. Add some black jeans, roll up the sleeves and you're good to go!